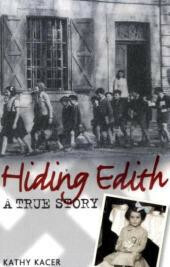 Hiding Edith tells the true story of Edith Schwalb. The Schwalb family were amongst the many Jewish families who fled their homes as Nazi power increased in the lead-up to World War II. Edith was sent to Moissac, a small town in the south of France where the whole village kept the secret of a couple (Shatta and Bouli Simon) who ran a children's home in the area and protected the identity of the Jewish children who stayed there. Eventually the home is forced to close and Edith experiences many other dangers, surviving to tell her tale. Kathy Kacer captures the spirit of young Edith in this dramatic and moving account of Edith's personal experience during World War II.